The Friends of the Davison Art Center at Wesleyan University helps expand and promote the Davison Art Center collection at Wesleyan. Every five years, this organization hosts a large fundraising event with an auction. 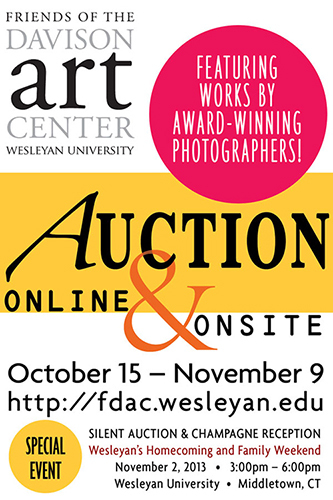 In 2013, the FDAC hosted their first-ever online auction that coincided with an in person silent auction. Samari Studios designed all of the online and print pieces for the event including postcards, posters, and lawn signs for promotion, customized posters for 40 silent auction items that maintained the look and feel of the event, special buttons and links for their website and social media, and coordinated with the printers for this project.